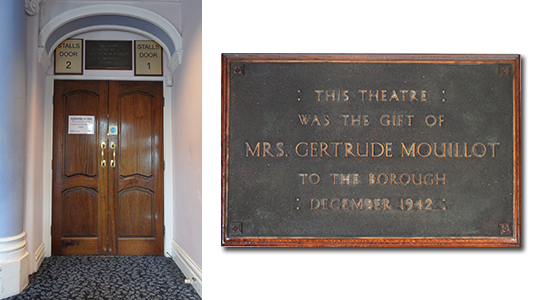 Without doubt, the most important person in the history of the Palace Theatre is Gertrude Mouillot, the proprietor who made a gift of the theatre to the people of the borough in 1942. This extraordinary act of generosity not only secured the theatre’s immediate future but, through a far-sighted caveat stating that the building must not be sold, this wonderful lady preserved this palace of entertainment for future generations, seeing it through some extremely difficult times to emerge, today, as a thriving centre for the performing arts. However, despite the building’s history being well documented, surprisingly little has been written about our remarkable benefactor. Indeed, it was not until the publication of Tales from the Palace Theatre, during the Centenary in 2012, that anyone had even attempted a detailed biography. The task for that book fell to writer, artist and lecturer Rachel Lichtenstein, who uncovered a wealth of information. More recently, a chance first time visit to the Palace in October 2012 by Anthony Edwards and his sister Frances, second cousins to Gertrude, whilst visiting Westcliff, where Frances had been born, captivated them both. They were amazed by this wonderful building and the infectious enthusiasm of its staff and supporters. Having met David Simpson, the Palace archivist, and his fellow enthusiasts, Anthony has since collaborated with David to write Gertrude’s story, with the aid of her 19th century Family Bible, letters, legal documents and photographs handed down to him by his father and great aunt from their cousin Gertrude. 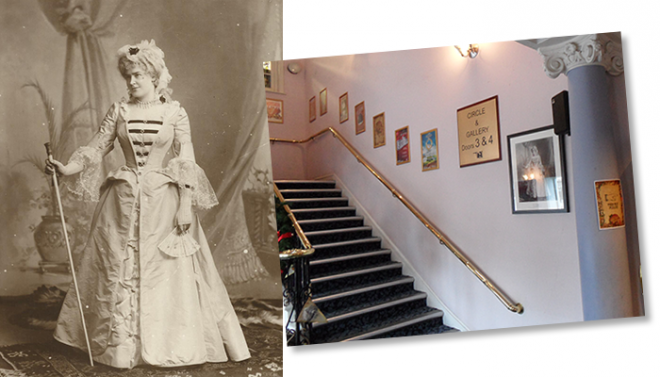 Anthony feels honoured and delighted that the Palace Theatre Club has agreed that its website will be the repository of Gertrude’s biography and that the full story about this very special lady will now be in safe hands for ever more. The following narrative, therefore, owes a debt of gratitude to Rachel, Anthony, David, and the Palace Theatre itself. According to her birth certificate, and the family bible, Gertrude Emily Davison was born in Creech St. Michael, a small village in the district of Taunton, Somerset, on 7th January 1867. Her middle name came from Emily Wills, an aunt. Her mother, Mary Jane Wills, had been born in the village and had married Robert Davison in the local church on 1st September 1864. Robert was a stonemason; undoubtedly not coincidently, Gertrude’s grandfather, Thomas Jarman Wills, was also in that profession. Robert had come down from his home town, Alnwick, in Northumberland, to work on Wells Cathedral. He had been born in Alnwick in 1841, just a few yards from Alnwick Castle, where he later worked for the Percy family, the Dukes of Northumberland. Immediately after their marriage, Robert and Mary had moved to Alnwick, later moving briefly back to Somerset for the birth of Gertrude in the family home . By 1868, when a third child was born, the family was living in London: the 1881 census shows the family living in Islington, while by 1891 they had moved to Brentford. No doubt the nature of Robert’s work led to this somewhat itinerant lifestyle. It is interesting that Robert named his first son after the 6th Duke of Northumberland, and only his second after himself. This reinforces the supposition that he was working at Syon House, near Brentford, the London seat of the Percy family. (The 6th Duke of Northumberland was a senior government minister.) Furthermore, by this time he was described in censuses as a sculptor and mosaicist, and Syon House was undergoing a massive refurbishment after the family had sold their palace in the Strand for an enormous sum. According to family legend passed down from Anthony Edwards’s great aunt, Blanche Edwards, who was her cousin, Gertrude became an actress more by opportunism than by training. By 1901 the family were living at 182 Marylebone Road. Following their mother’s death in 1888, at the age of only forty-nine, of cancer of the womb, it seemed that Gertrude was predestined to be a spinster, living at home looking after her two brothers, Algernon and William, and sister Eleanor,. (In censuses, Eleanor was described as a spinster, while the two brothers were described as draughtsmen.) The family was sufficiently well off to have a domestic servant. However, by chance, so the story goes, a young widowed impresario aged thirty by the name of Frederick Mouillot saw Gertrude waving goodbye to a friend at one of the main railway stations. He was with a troupe of his actors, about to leave for their next venue, and allegedly mistook her for an actress. He asked her to come to his office after she had completed her current engagements for an interview and possible employment. The story goes that Gertrude immediately went on an intensive acting course, went for the interview – and was so successful that she married Frederick not long afterwards! Her successful ability to act as if she were an actress goes a fair way to confirming she was, indeed, a good actress! This is presumably not a complete list. But, assuming it is chronological, it shows her quickly taking on title roles, and her appearances with celebrated American actor Hermann Vezin and equally famous actor and theatre manager Herbert Beerbohm Tree indicate the esteem in which she must have been held; although it has to be said that her relationship with Frederick, the successful impresario, would not exactly have held her back. Gertrude’s second cousins Anthony and Frances Edwards kindly donated to the Club a framed copy of this lovely portrait photograph. The theatre management have kindly allowed it to be put on display, at the foot of the Grand Staircase. This is a wonderful memento of a remarkable lady. On 2nd April 1895 Gertrude Emily Davison married Frederick Charles Arthur Mouillot at St. Stephen’s, Shepherd’s Bush, west London. As in the censuses, Gertrude was described as a “spinster”; perhaps “actress” would have carried unfortunate connotations in those days! Gertrude’s address was given as Hammersmith (so presumably she had moved away from Marylebone Road), while Frederick’s was shown as Euston Square. With a touch of vanity, Gertrude ‘reduced’ her age by three years, with the marriage certificate recording her as twenty-four, whereas she was twenty-seven. Quite possibly Frederick never knew the truth! 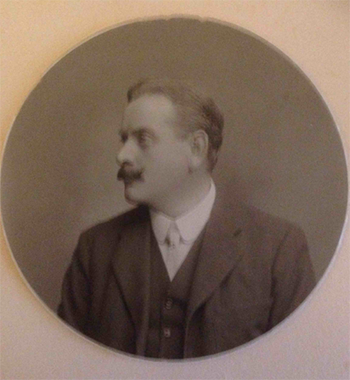 Frederick had been born in Suffolk Street, Dublin on 31st May 1864. His family had an aristocratic pedigree, with connections to the de Thierry family who were French aristocrats, some of whom escaped the revolution but 14 of whom were guillotined. Supposition suggests the survivors arrived in England penniless but with a good education and the ability to build new, reasonably prosperous lives. Frederick’s father, Auguste Comte Mouillot, who had married in 1847, in Holborn, central London, became a British citizen in 1879, while he was living in Dublin. He was a hotel owner, but he had died by the time Frederick married Gertrude. Just a year earlier, Frederick had been involved in what is still the worst recorded theatre fire in English history: the terrible conflagration that destroyed the Theatre Royal, Exeter, on the night of Monday 5th September 1887, with a loss of nearly two hundred lives. Indeed, it was he who spoke the final lines before the tragedy unfolded. During the 1890s, around the time Frederick married Gertrude, the Morell and Mouillot business was dramatically expanding. By 27th July 1897, when they opened the Queen’s Opera House at Crouch End, north London [later the Crouch End Hippodrome; destroyed by bombing during World War II] with the popular ‘Japanese operetta’ The Geisha, they owned another 17 theatres, including the Grand Theatre, Swansea. On 13th December 1897 the Theatre Royal, Dublin, designed by the famous theatre architect Frank Matcham, was opened by Mr. Morell and “the actor-manager Mr. Frederick Mouillot with the assistance of a group of Dublin businessmen”. By 1904, they were managing Terry’s Theatre on the Strand, central London [demolished in 1923] and by 1908 they owned and managed the Hippodrome Theatre, Colchester [now a nightclub]. Part of their success was attributed to them touring the same acts around their many theatres. The performers were offered a smaller wage than they would have earned for appearing at just one theatre, but they had guaranteed work for months at a time. By 1906 Frederick was reported, in the Green Room Book, to be the proprietor or managing director of numerous theatres and music halls including the Theatre Royal, Dublin [demolished]; Grand Opera House, Belfast; Theatre Royal, Belfast [demolished]; Opera House, Cork [destroyed by fire in 1955; present Opera House built in 1963]; Theatre Royal, Jersey [now Jersey Opera House]; Broadway Theatre, New Cross, London SE [demolished]; Theatre Royal, Bournemouth; Hippodrome, Boscombe [now a nightclub]; Grand Theatre, Southampton [demolished]; Hippodrome, Southampton [destroyed by bombing during WWII]; Grand Theatre, Swansea; Hippodrome, Margate [demolished]; Opera House, Tunbridge Wells [public house]; Queens Theatre, Leeds [demolished] and Metropole Theatre, Glasgow [demolished]. Frederick was also involved in businesses in Australia and South America, and also South Africa, where he was one of the original directors of The Electric Theatres, which had at least five cinema/theatres in Cape Town and a cinema in Durban for the black population, and a large number of touring companies. He was part author, with Edward Abbott Parry, playwright, author and senior barrister, of What The Butler Saw and What’s the Matter with London? The former, Parry’s most successful play, was first performed in 1905. 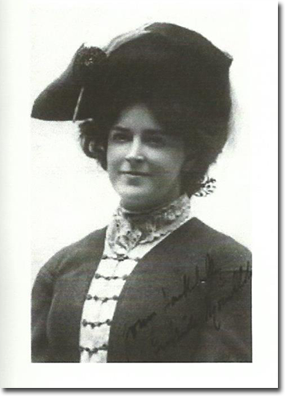 Another, The Captain of the School was performed in London and Manchester in 1910 with Parry’s younger daughter, Dorothy, playing the role of the heroine Rhoda McIntyre. Gertrude also appeared in this play. After Frederick died in 1911 Parry had ideas for further plays, but had not the heart to continue with them after the death of his friend and he became a judge at Lambeth County Court. Frederick’s hobbies were listed in the Green Room Book as “theatres, music halls and taking long voyages” (not too surprising, given his far-flung business interests!). His address was given as 1 and 2 King Street, Covent Garden (his offices) and his clubs were said to be the Green Room (London), Vernon (Belfast) and Ormonde (Dublin). The newlyweds must have been incredibly busy. One source says that, from 1898 to 1902, they lived in the small town of Jubilee, outside Swansea (where Frederick and his partner owned the Grand Theatre). However, the 1901 census shows them living at 1 Princes Street, near Hanover Square, in central London, with Anne Matthews, a twenty year old domestic servant. As a successful couple, it is entirely possible they owned houses in both places at the same time. (In the census, Frederick was described as a theatrical proprietor, while Gertrude, it seems, was by then comfortable with the occupation of actress.) By 1904 they were living at Whitethorns, Weydown Road, Haslemere, Surrey, in a grand five bedroom Edwardian house that had been built in 1902. According to estate agents’ ledgers preserved in Haslemere Museum Library the house had been “let to Mr. Mouillot for 3yrs @ £85 with a view to purchase”. They clearly had a lot of fun together, and with their friends. There is a fascinating set of photographs, of them in costume, being serious and also, apparently, larking about, in the Gertrude Mouillot Album section in the Photo Galleries. Little is known of Gertrude’s political views, but the Cambridge University Press publication ‘Victorian and Edwardian Theatre’, in the chapter ‘Suffrage Theatre’, reported on the 9th November 1909 meeting of ‘theatre and politics’ by the Actresses’ Franchise League at the Scala Theatre [presumably the later Prince of Wales Theatre, central London; demolished 1969] which included Gertrude’s own play, (the possibly heavily ironically titled) The Master. Also present was famed actress Ellen Terry, so this was clearly a very significant event on the road to women’s suffrage. It would not be a surprise that a forthright, ambitious, articulate lady such as Gertrude would wish to align herself with this cause. Any plans the happy couple might have had for a family ended on 5th August 1911, when Frederick suddenly dropped dead from a heart attack at The Royal Albion Hotel, in Brighton. He was just forty-seven years old. His body was taken to Haslemere, where he was laid to rest in the Derby Road Churchyard on 8th August. The 1911 census shows Gertrude’s 70 year old father living in Twickenham, with a 46 year old domestic who came from Belgium. 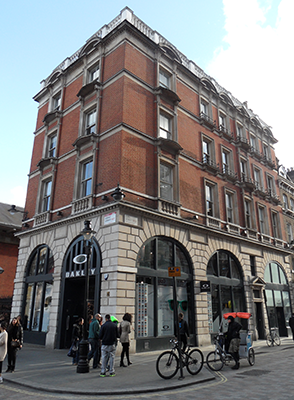 Meanwhile Gertrude’s two brothers were still living at 182 Marylebone Road, their sister Eleanor having by then died. Gertrude and Frederick’s ‘official’ residence was still at Haslemere. 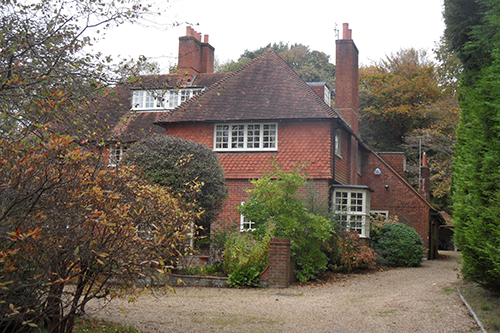 Presumably Frederick’s death ended any plans for the house in Haslemere to be purchased (with no children, the large house would have been quite unsuitable for Gertrude on her own – and would, no doubt, have held too many memories). In January 1912 the estate agent’s records referred to “Mrs. Mouillot (Tenant)” but it is unclear when she moved out. It is known that she had a succession of houses in London: in Hanover Square, with Frederick; in South Kensington (in the 1920s and 1930s) and in Western Avenue, Brent in her later years. It is thought that the Mouillot and Morell partnership might have ended prior to Frederick’s death. Gertrude is said to have been left £4,000 and responsibility for Frederick’s 15 (unnamed) theatres. Naturally, she was devastated by her husband’s untimely death. At a private dinner party at the Savoy, hosted by his father following Gertrude’s death, Anthony Edwards met Patrick Selby, the production and advertising manager for impresario Emile Littler and son of Percival Selby, who became Gertrude’s business manager, running her ‘empire’ and making it very successful. Patrick said Gertrude had “gone to pieces” (she never acted again) and, for at least two years, left his father to run her businesses. Percival was a prominent theatre manager and President of the Theatre Managers’ Association, which had been founded in 1895 by Sir Henry Irving. So Gertrude had a good man to look after her interests and, under Percival’s stewardship, it is estimated that by 1939 she was worth in the region of £250,000 (although it seems that, after her period of mourning and despair, Gertrude once again took an active part in the running of her businesses). It seems that Percival handled Gertrude’s tax affairs and royalties until he died in about 1954. The following year, Patrick wrote to Gertrude saying, with regret, that he was unable to carry on his father’s work as, following his father’s death, he no longer had an office of his own. Back in early 1920 Gertrude purchased the Palace Theatre for £25,000. It is not known why she did so, other than as a speculative business venture, perhaps on Percival’s advice, although it could also have been some sort of ‘statement’ that she was her own woman, with this being ‘her’ theatre, as opposed to the previous theatres being, at best, ‘hers and her husbands’. She certainly proudly announced herself as “sole proprietoress” in the programmes. Due, no doubt, to her extensive theatrical connections, Gertrude attracted a high class of performer to the Palace, including Dame Sybil Thorndike, Mrs. Patrick Campbell and matinee idol Ivor Novello who, in a first night curtain speech for his play The Rat said “Such a reception as this takes one’s breath away. I have never been to Westcliff before, but it looks like we’re in for a damn good week.” In December 1922 a young Ralph Richardson played Horatio in a performance of Hamlet staged by Charles Doran and his celebrated Shakespeare Company. But there were also difficult times, and there were short periods of closure. In the 1930s the management was forced to deny rumours in the local press that the theatre would be closing for good. In an attempt to diversify, Mr. P. M. Selby, described as “general manager”, applied for a music and drinks licence, saying that times were difficult but this didn’t mean a change in policy. The licence was granted by Southend Justices in June 1932. Then, the full-time ‘Palace Cinema’ opened in October 1932, but failed to attract any really big films, and the theatre reverted to live shows in April the following year. On Monday 26th March 1934 there was even a “Grand Boxing Tournament”! By 1939 the situation must have reached breaking point, as Gertrude, through her solicitor, tried to persuade Southend Council to purchase the theatre. Having been rebuffed, the theatre soldiered on into 1940, finally closing in grand style on Sunday 2nd June with a Gala Concert, in aid of the Red Cross Fund, at which much-loved comedian Tommy Trinder topped the bill. Gertrude’s widowed father had retired to Twickenham, not far from Syon House, and when he died, in 1930, he left his money to the eldest bachelor son, Algernon Percy. When he, in turn, died, in 1941, he left his money to the next son, William Henry Burke, also a bachelor who, when he died a year later, left the accumulated inheritances, some £17,000, to his sister Gertrude. Together with investments and existing savings the 75 year old lady would undoubtedly have had ample funds for a quiet retirement. So, in autumn 1942, with war a reality and, it would appear, no prospect of a sale, Gertrude presented the theatre as a gift to the people of Southend. The conveyance of the Palace to the Corporation was completed on 31st December 1942. A plaque above the entrance to the stalls commemorates her gift. Gertrude lived, alone, in Western Avenue, Brent, north-west London, in her later years, where Anthony Edwards’ great aunt Blanche visited her regularly. Eventually Frederick’s brother’s son, who lived in Colchester and had also kept in touch, had her moved from the house, on account of her age and believing she was not able to look after herself. A solicitor in Colchester, Mr Puxon, was also involved as she was moved to that town, first to a hospital, then to a nursing home, where she died. Patrick Selby had kept in touch right up until Gertrude died. Indeed, he was one of only two non-family members at her funeral, and was instrumental in having Gertrude looked after properly in the last months before she died, as she was eccentric and stubborn in admitting that she needed any help. He knew she would be angry with him but felt he was doing “the right thing” in getting the NHS involved as she was clearly unable to look after herself. He was very upset at seeing her in such a poor state of health after having known her, as he wrote in one letter, in her “queenly prime”. On 10th March 1965 the Southend Standard, which had not seen fit to afford Gertrude an obituary, reported that the will she made in hospital shortly before she died was being challenged by two of her relatives. The report said she had built up a fortune of £220,000. This was clearly the accumulated inheritances from her own Davison family, the house in Brent and bank deposits from the sale proceeds from all the theatres which had been managed by the Selby family on her behalf since 1911. The relatives were great aunt Blanche and Anthony Edwards’s father. The challenge was successful, the will was set aside and they received what was their due as blood relatives in intestacy. Frederick’s brother’s sons’ family received the balance. Even if Gertrude made this extraordinary gift out of sheer frustration it was, without doubt, a very remarkable gesture, one which future generations of theatregoers have had, and will continue to have, much cause to celebrate. And, even though she made no money from the disposal, perhaps this grand lady had the last laugh after all, by inserting the caveat that “it must not be sold”. There is little doubt that a great many Council members through the years have had occasion to rue this clause, but this venerable old theatre has kept on going and is now in the best shape it has been for years, with audiences flocking to its mix of plays, musical events, one-night shows and myriad other entertainments. It might well be that Gertrude would be astonished to hear the Palace is still going strong, into its Centenary year and beyond, but I’m sure this truly remarkable lady would have a quiet smile of satisfaction that ‘her’ Palace Theatre is still here, doing what it does best. 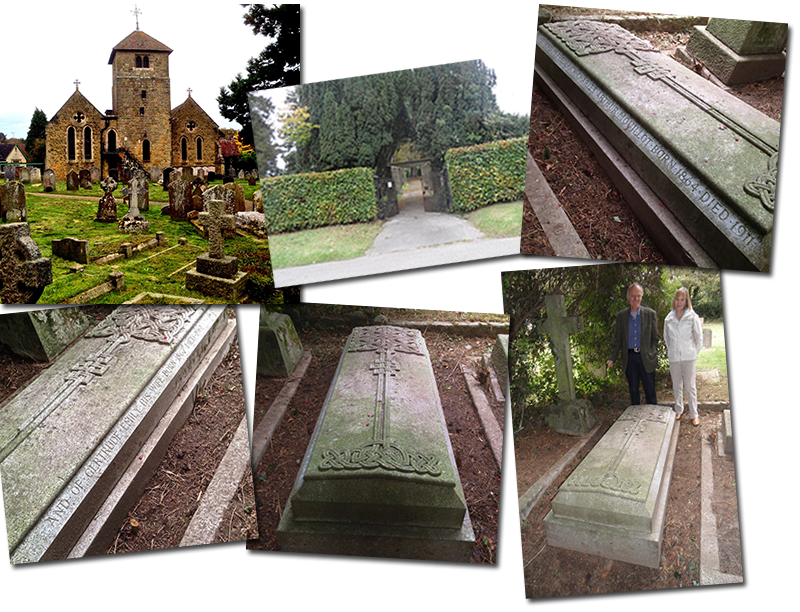 We would like to put on record our grateful thanks to Philip Hunt, Churchyards Representative, St. Bartholomew’s Church, Haslemere and Shirley Richmond, Library Volunteer, Haslemere Museum for their assistance in identifying, in Haslemere, Gertrude and Frederick’s home and final resting place. This page was added by Ian Grant on 18/10/2013.